In their daily lives, amputees are faced with seemingly insurmountable obstacles such as crowds of people and paths with rough surfaces. With the right leg prosthesis, such hurdles are easy to overcome. The C-Leg is a microprocessor-controlled prosthetic leg that makes the life of many people with above-knee amputations much easier. The fact that more than 60,000 people worldwide use the C-Leg attests to the strengths of this technology. 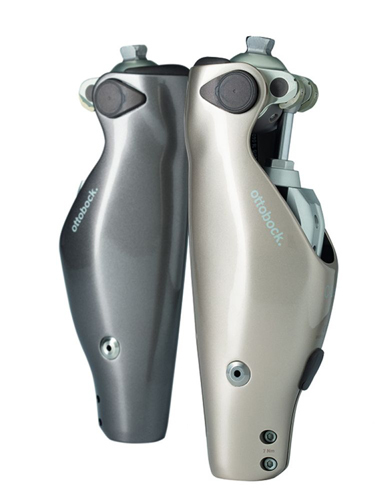 The medical technology company Ottobock developed the leg prosthesis and the accompanying C-Leg technology. It was first launched in 1997 and has been developed continuously ever since. The current model is the C-Leg 4, the best C-Leg of all time according to the manufacturer. Enhanced stumble recovery, improvements in the stance and swing phase, a new carbon fiber frame design, and an intuitive stance function allow the C-Leg to be used in a wider range of applications. Studies show that the fourth generation C-Leg is the safest model with a microprocessor-controlled knee joint. The intelligent knee joint continuously monitors which phase of the gait cycle the prosthesis wearer is in and adjusts in real time. This allows users to move about freely without having to concentrate on their steps all the time, for example when they are going downstairs, walking on challenging surfaces, or even moving backwards. On the new C-Leg, various mechanical and electronic adjustments provide improved swing phase control. As a result, the user of the prosthesis has a more natural gait and can move the knee joint more easily. How exactly does the C-Leg work? The intelligent control function of the prosthesis adapts to the individual gait pattern of each user. The leg is operated by a microprocessor-controlled hydraulic unit that adjusts the system dynamically to any walking speed. At the same time, the controller ensures that the stance phase of the prosthesis is secure. The control mechanism is based on a complex system of sensors. These record the load on the knee joint every 0.02 seconds to accurately identify the phase of the gait cycle. Two valves that are adjusted by maxon RE-max 13 motors modify the characteristics of the hydraulic system. Two motors are used in each C-Leg. The key features of these DC motors are their compact design and relatively high power output. “I can't remember when I last stumbled. It's great!” says Geno from the US (on the left in the picture), enthusiastically describing his life with the C-Leg. The success story of the C-Leg goes on and on. More and more people are adopting this intelligent prosthetic leg to regain their independence.